On April 8, 2015, Syndicate published my review essay on David Harvey’s Seventeen Contradiction and the End of Capitalism. Syndicate: A New Forum for Theology has been among the best outlets for my academic creativity over the last year, as they constantly push me to think thoroughly about the theory that undergirds my work on grounded theologies. In this essay, they pushed me on my own discipline: human geography. And they did so by having me engage my PhD supervisor David Ley‘s nemesis, David Harvey. Finding the presence of theology inhabiting both Ley and Harvey’s work, I wrote my engagement with Harvey’s newest book by examining how both Ley and Harvey do theology – and how that theology can possibly bring them together under the acknowledgement that capital has become a personal god in the modern order. As you’ll see in the response, Harvey was intrigued by these thoughts, but he doesn’t buy it completely. I had planned to write a reply to Harvey on the site, but I never got around to it as April was a very busy conference month for me. I did get to meet Harvey at the American Association of Geographers meeting later that month in Chicago – an encounter that Ley tells me he witnessed but did not want to disturb as he was descending an elevator into the hotel lobby. This essay will probably turn into something bigger (and hopefully better) as I play around some more with these ideas, and hopefully then, I’ll have an even more serious engagement with Harvey. I’m very thankful to Syndicate’s managing editor Christian Amondson for publishing this piece and the editor/founder of Syndicate, Silas Morgan, for his very able organizational powers in making this forum happen. Read his forum introduction here. I am writing from Tampa, Florida to talk about the national conference that I am attending. As usual, I am at the Annual Meeting of the Association of American Geographers. There’s a lot going on here in geographies of religion (check out our specialty group’s newsletter) – the field seems to be growing, though many of my colleagues couldn’t attend this year! – and I will also be checking out sessions on migration, Asian geographies, urban studies, and other things, in addition to meeting colleagues and catching up with old ones. After Hong Kong returned to Chinese sovereignty in 1997, the Special Administrative Region has seen the emergence of calls for universal suffrage, the preservation of civil liberties, and solidarity with the materially marginalized in Hong Kong’s civil society. In one moment of collective solidarity, an umbrella group called the Civil Human Rights Front launched a protest against anti-sedition legislation based on Basic Law’s Article 23, a law whose alleged threats to free speech drove some 500,000 Hongkongers to the streets on 1 July 2003. This paper analyzes the radical democrats who have been key to such political placemaking activities in Hong Kong, contesting the city’s policy landscape through physical demonstrations. It argues that while a wide swath of Hong Kong’s Catholics and Protestants have historically been allied with the state establishment both under British and Chinese sovereignty, the emergence of radical democratic groups like the Civil Human Rights Front have been driven largely by Catholic and Protestant Christians who emphasize a separation of church governance from the state. While the separation of church and state has often lent itself in other contexts to more conservative politics, this spatial schematic has led these radical democratic activists, their churches, and their solidarity groups to contest the modus operandi of Chinese sovereignty. This is thus a contribution to critical geographies of religion, for it shows the potential power of religious movements to critique the practices of the state in order to imagine more socially just cities. There are two parts to this session. I am the first paper on the first part, which promises to be an engaging discussion on religion, politics, and the public sphere. Find us in Room 17 on the First Floor of the Tampa Convention Center. The first session is from 2:40 PM – 4:20 PM. The second session runs from 4:40 PM – 6:20 PM. It has become popular in recent years to see the Fascist years in Italy as reflecting the relatively successful transformation of Italian society at the behest of its Fascist rulers. This reflects both the rehabilitation of Fascism in contemporary Italy and the “cultural turn” in Italian historiography that has tended to emphasize the “making” of Fascist selves and other markers, such as the makeover of many urban monumental spaces, as measures of the regime’s success. My purpose is to disrupt this emerging consensus, alongside other commentators I hasten to add, by pointing how much the Fascist regime had to collaborate with other powers, not least the Catholic Church, and was often outflanked by them in its designs, most notably in efforts at making over the city of Rome as its showcase capital. We want as many people as we can to attend, and we hope to see many of your there! Find us in Room 23 of the First Floor of the Tampa Convention Center, Wednesday, 9 April, 10 AM – 11:40 AM. Please also join us for our business meeting. That is scheduled for Thursday, 10 April, from 7:30 PM – 8:30 PM in Room 9, Tampa Convention Center, First Floor. I will be chairing, and if you want the meeting agenda, please email me. I look forward to a lot of collegial interaction this week, and I am anticipating learning a lot! It’s great to be with people in my home discipline, and I hope I have more to bring this year from all of my interdisciplinary journeying. I am happy to announce the publication of a book review essay that I put into the Association of American Geographers’ (AAG) Review of Books, a book review journal that has recently become independent of its mother publication, the Annals of the Association of American Geographers, one of the flagship journals of our discipline. Jason Dittmer and Tristan Sturm’s edited collection, Mapping the End Times: American Evangelical Geopolitics and Apocalyptic Visions, is a contribution to political geography, specifically critical geopolitics. This subfield of human geography examines how political borders are constructed and maintained, often critiquing these constructions in the hope of mitigating warfare and making peace between nation-states. This edited collection explores how American evangelicals contribute to these political formations through their eschatology, their theology of the end times, and seeks to unpack a diverse range of these eschatologies and their effects on global geopolitics. Jason Hackworth’s Faith Based: Religious Neoliberaism and the Politics of Welfare in the United States is a contribution to economic geography, specifically critical political economy. This subfield of human geography examines how specific places function in economic flows, explores how those flows have been informed by and inform the grounding of various economic ideologies in global and national economies, and observes that economics is integral to an understanding of state governance. What is critical about critical political economy is its exploration of neoliberalism, a style of economic governance in which states practice the deregulation of the market in an attempt to free market forces to generate capitalist prosperity in a national economy. Hackworth’s book explains how some American evangelicals have partially cooperated in the proliferation of neoliberal ideologies in the United States. The angle that I take in my book review focuses on how successful these books are in capturing the range of evangelical theologies being grounded in America. Accordingly, I have questions for each author about how the version(s) of evangelicalism that they explore all have counter-examples that embrace different takes on theology and place. I recognize and commend the books as good introductions to a multi-faceted theological phenomenon that has long gone neglected in human geography, but I am insistent that these are just ‘starting points’ for further research that needs to capture the range of evangelicalisms being grounded in the United States. I also note that this is the first of three unique and original book reviews that I have written on Wilford’s Sacred Subdivisions. I have worked carefully with the editors of the AAG Review of Books, as well as forthcoming reviews in Religious Studies Review and the Social and Cultural Geography review forum on Wilford’s book to guard against self-plagiarism. 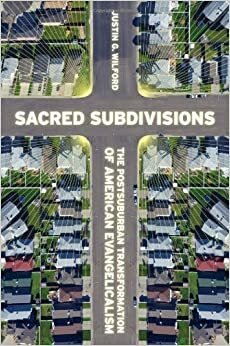 The result is that I have written three reviews that open up and critique three different aspects of Sacred Subdivisions. That it is possible to write three unique book reviews of Wilford’s account of Saddleback Church speaks volumes about what a multi-dimensional text it is, and though I provide critical comments on the book in each of the reviews, Wilford is to be commended for writing such a rich ethnography. Finally, that this week’s news has been dominated in part by the interaction among Rick Warren, Asian American evangelicals, and evangelicals in Hong Kong is a matter of sheer fortuitous timing. This review, as well as the one forthcoming in Religious Studies Review, was authored in May, and the contribution to Social and Cultural Geography was submitted two weeks ago. The events of this week simply reinforce my argument in this review essay regarding the urgency for geographers to study the American evangelicalisms that have been introduced, but not fully unpacked, by these books. UPDATE: the SCG review forum piece was substantially revised and submitted in November 2013 to better reflect the events surrounding the Asian American evangelical open letter. It should be published in 2014. 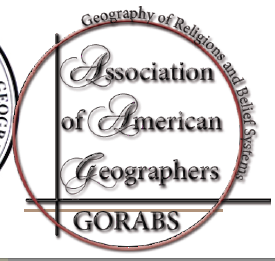 I’m happy to announce that I’ve been elected to be Chair of the Geography of Religion and Belief Systems (GORABS) Specialty Group at the Association of American Geographers (AAG). This follows two years of being the GORABS secretary. David Butler (University College Cork) is now immediate past chair, Garrett Smith (Kennesaw State University) is now secretary, and David Rutherford (University of Mississippi) has kindly agreed to stay as treasurer. I see the job of the GORABS Chair as to promote religion as an analytic in human geography by liaising with the academic geography community through the Association of American Geographers. This means that at a practical level, my job is to represent our specialty group to the AAG organizers, to make sure religion sessions and papers at the AAG get sponsored, to recruit an Annual Lecturer for the next two years, and to raise awareness about developments in religion, secularization, and belief systems in the discipline. I’ll be working with a very well-constituted board that is committed to advancing geographies of religion as a growing field in both human geography and religious studies. If you are working in geographies of religion and want to present a paper or organize a session at the AAG in 2014 and 2015, please contact me with any ideas you might have so that we can get those sessions sponsored. At a theoretical level, my job, as is the job of the board, is to demonstrate to the geography community that geographies of religion are broader than what has conventionally counted as the scholarship in a small subfield of cultural geography. Religion isn’t just an object to be mapped, nor is it a subject to be studied. It is an analytic that seeks to unpack the uneven geographies of secularization processes, the grounded theologies that undergird both conventionally ‘religious’ and ‘secular’ practices, the experiences of lived religions (including what’s becoming known as a ‘hauntological’ approach), and the way that ‘belief systems’ aren’t fully worked out worldviews but geographical imaginations that undergird political, economic, social, and cultural processes in the world. Just as race, class, gender, and sexuality are analytics in human geography, religion as an analytic can lead to theoretical innovations and open doors to new empirical work in geography. These in turn are critical geographies, challenging modern modalities of space not only with the existence of religious phenomena, but by forcing geographers to reckon with the circulation of uncritical secular theoretical postulations even in our own discipline. Studies in geographies of religion are thus central to the continuous re-imagination of what it means to do geography as academic practitioners. I am optimistic about the next two years, and I am excited, as our field has been growing by leaps and bounds in the last few years. I expect nothing less in the next few as well. If you want to keep track of these developments, please like us on Facebook and add yourself to the JISCMail listserv.